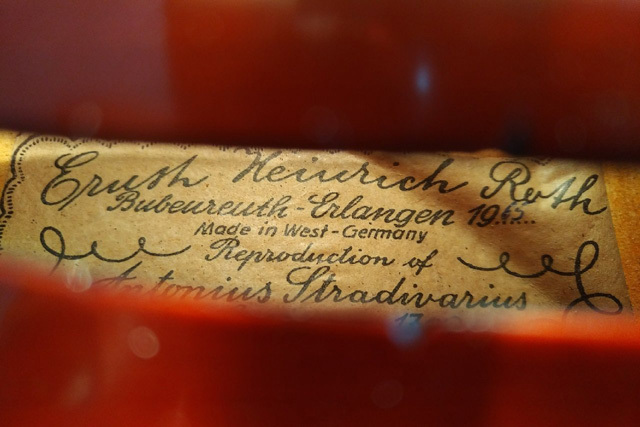 This mature, warm and brilliant sounding German violin by Ernst Heinrich Roth in Bubenreuth is a typical Bubenreuth instrument with its luminous red spirit-oil varnish over a golden-yellow background. Crafted in a Bubenreuth in 1965 its Stradivarius model, the sound holes and powerful scroll reveal that it is part of the Saxonian tradition, hailing from the Bohemian-Saxonian "Musikwinkel" region around Markneukirchen. Good quality tone woods were used to make the two-piece flamed maple back and the spruce top with its regular grain. This powerful quality instrument (similar quality Roth violins retail new for over 2,500) has no repairs - it can be strongly recommended with its powerful, bright ringing sound that is rich in overtones and balanced across the strings. This successful E.H. Roth Stradivari replica is available to you in perfect condition after having been worked over meticulously by our violin makers.